Linguistische Berichte (LB) 255. 2018. 152 Seiten. This paper documents an unexpected interaction between modal flavour and modal force in the domain of the German necessity modals muss (≈ ‘must’) and soll (≈ ‘be supposed to’) and their Konjunktiv II-inflected versions müsste and sollte. We argue for the following three proposals. First, muss and soll have largely disjoint modal flavours, in both the root and epistemic domains. The root modal flavours of muss are deontic, teleological, and a restricted bouletic use, while root soll is lexically bouletic, allowing deontic inferences; epistemic muss is inferential, while epistemic soll is reportative. Second, the addition of Konjunktiv II counterfactual morphology can create weak necessity modals, as expected on the cross-linguistic account of von Fintel and Iatridou (2008). However, an unanticipated effect on modal flavor occurs. When soll turns into its Konjunktiv II form sollte, it not only becomes a weak necessity modal, it also changes its modal flavours to those of muss. Sollte is thus semantically a weak necessity form of muss, not of soll. Third, the Konjunktiv II form of muss, namely müsste, also shows an unexpected quirk. We analyze this as the interference of polite Konjunktiv II, analyzed as free factive subjunctive (Csipak 2015), with the weak necessity reading. 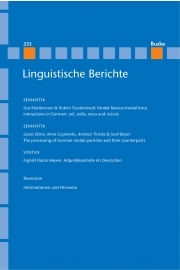 The paper also includes a comparison of the German modals with English have to, should and be supposed to. Modal particles (MPs) like German bloß form a heterogeneous lexical category. One common property is that they do not contribute to the propositional meaning of a sentence, but rather display a Not-At-Issue (NAI) meaning. All of these words are ambiguous between the NAI meaning of the MP and an At-Issue (AI) meaning of a counterpart (e.g., focus particles, adverbs, and conjunctions). Unlike MPs, the counterpart typically affects truth conditions, like bloß as a focus particle with the translation ‘only’. So far, there has been little psycholinguistic research on the processing of MPs, the counterparts and their differing contributions to sentence meaning. We present the results of a corpus study where we measured the relative frequencies of both MP and counterpart readings (i.e., whether a specific word occurs more often as an MP or a counterpart) and a self-paced reading experiment on the processing of both meaning types. In our experiment, we varied MP and counterpart readings, and the position of the disambiguating region. We also examined the influence of the relative frequencies of both meaning types on the processing. The results point to processing differences between the NAI and the AI meaning of German MPs and their counterparts, suggesting that the two meanings are represented in different dimensions of meaning. 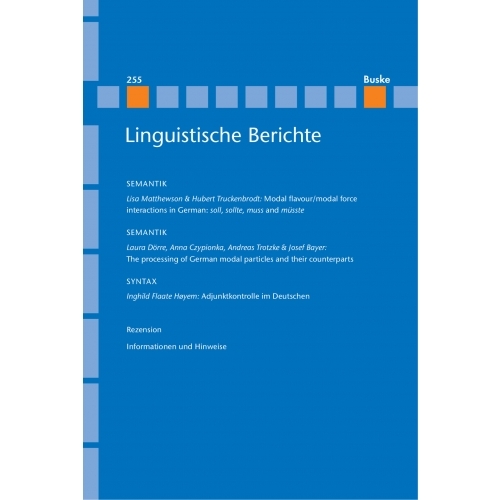 This paper examines the control status of German adjunct infinitives headed by (an)statt, ohne and um. Contrary to previous analyses, I argue that most of these adjuncts display the OC properties described by Landau (2013): The controller must be an argument of the adjunct’s matrix clause (usually, but not always, a subject), long-distance and arbitrary control are ruled out, OC PRO only allows a sloppy reading under ellipsis, and they freely allow inanimate PRO. Assuming a modified version of Landau’s OC-as-AGREE-analysis based on Zeijlstra (2012), Wurmbrand (2011, 2014) and Fischer (2016), OC is analyzed as upward multiple AGREE between a functional head F, an explicit or implicit antecedent, and PRO. Drawing on ideas in Sigurðsson (2004, 2014), NOC is analyzed as contextual pragmatic control. The control status of an adjunct is affected both by its semantic type and its syntactic position. Event and process modifying adjuncts in the c-command domain of T always display OC, including split control. In contrast, adjuncts adjoined above T display NOC. In the German adjuncts under investigation, this is only attested in speech act adjuncts, typically with the speaker/writer as antecedent, and in consecutive adjuncts, with a dativus iudicantis (Engl. estimative dative) as antecedent.